A couple of years ago (in 2008) I blogged a Top 10 Hotels in Phuket 2008, the list being based on TripAdvisor ratings, which on average (if there are plenty of ratings) give a good idea of quality. 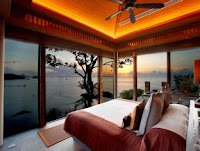 Sure there may be occasional odd reviews - some sound like advertising and you hear rumours that some reviews may be written by people connected with a hotel, or by competitors, but if there are enough reviews I think you can see through the fog and figure out what are the best hotels in Phuket. 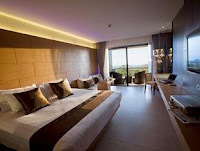 This is an updated 2011 Top 10 list to give an idea of some of the best hotels in Phuket. 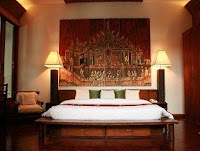 A new 5 star resort, found overlooking Kamala Beach with luxury villas and a fancy restaurant called "Silk". This is a place to relax and be pampered. All villas have private pools.. Note that the resort is not right on the beach but there is a shuttle to the private Beach Club. I reviewed Boomerang Village on the blog in 2009 - it was not in the original top 10 in 2008 but certainly is now, and its quite different to some other hotels - on the hillside behind Kata and Beaches, not on the beach at all, but obviously very popular! I wrote about The Slate, formerly Indigo Pearl in 2008 and it was already in the top 10 list back then - it's a top class resort and has a very original look and feel with decor based on the old Phuket tin mining days. It may not be to everyone's liking, but it's got class and it's not afraid to be different! Mom Tri is one of Phuket's innovators. 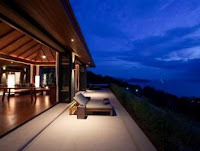 The Villa Royale was built on land which used to be his home, on the headland overlooking Kata Noi beach. A stairway from the hotel takes you down to the water. Great views from the rooms and restaurant too. It's got that bit of class, only has about 30 rooms/suites and is often full! Cape Panwa is one of our favourite areas of Phuket away from the crowds. The last top 10 list included Cape Panwa Hotel... this time you have Sri Panwa which is a newer resort, with about 50 luxury pool villas - some facing west, some facing east over the sea. Great views, just do note that Panwa is a little out of the way, suitable if you want peace and quiet. I'd not heard of this one ... And quite surprised to see a hotel on Nanai Road in the top 10 list! Actually it's more like a guesthouse with a pool. Only 20 rooms. Nanai road is the back road in Patong, quite a long way from the beach. You're in the hills away from the crowds. Lots of small hotels here and lots of restaurants including plenty of foreign run places with food from all over the world! Paresa Resort is located just outside Kamala on the road that winds around the southern headland, sometimes called Millionaires Mile. Great sea views, but do note that the resort is not on the beach - it hangs over the "Kamala Cliffs". I think I'd be happy to sit there all day in my private pool away from the worries of the world. A place like this is a real getaway. Much as I dislike Patong, there are some very good hotels and resorts to be found. Holiday Inn has been there for years, since before I arrived here in 1999, though it's had new wings built onto it since then. Surprising to see an "old" hotel in the Top 10? Well, that to me means they obviously have great service. Seems to be especially popular with families - I would not stay here if I was looking for a romantic couples hotel. Avista only opened at the end of 2009. I remember going with some customers who thought it was great. It's on the hill just at the north end of Kata Beach and built in what they call a modern style (i.e. it does not look like an old Thai temple!). Reviews good and only seem to worry about the hill you have to walk up to get back to the hotel from the beach. Located on the hillside overlooking Karon Beach, Pacific Club's owner Eric is a chef and also owner of the Karon Cafe in the center of Karon. 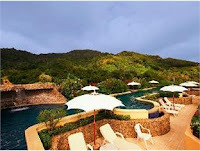 It's a small resort with a personal feel and panoramic views over sea and hills. It's up a small side road, away from the main road and yet only about 10 minutes walk to Karon Beach. Ideal for those wanting seclusion, but still easy access to the main beach centers. Was also in the 2008 Top 10, so obviously has some lasting appeal. Agree with the top 10? Stayed somewhere else that you thought was better? Do add a comment below. You'll notice that many of these are top end resorts, 5 star, many are on more secluded beaches and many of them (like Andara or Avista) are new resorts that have only been open a year or two. There are new luxury resorts opening every year all over the island like the Westin Siray Bay or Renaissance Mai Khao Beach that have opened recently. 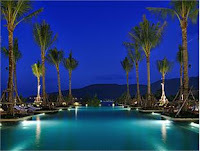 Phuket IS trying to push the luxury lifestyle, and it's often said that Thailand does luxury very well. 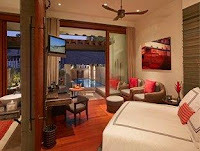 I put Phuket hotel reviews on this blog now and then. Hotels chosen due to reputation or good reviews or because they offer something different. Hope it helps people to make a decision. For hotel bookings, I recommend looking at Agoda. I want to write something else on the blog about "reviews" in general, as when I look at Agoda or TripAdvisor I see recurring themes, small complaints about breakfasts or expensive food (in a 5 star resort.. no, you think?) or location being too far from something or other.... and the top 10 on TripAdvisor keeps changing! Anyway.. all the hotels listed here have enough reviews to keep you reading for hours! 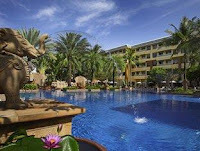 For Phuket hotel booking and more information, I heartily recommend Agoda.com. Look there first! Google Map - Location of this "Top 10"